You can print out this listing by clicking here to download our brochure. BLACK SWAN ANTIQUES | (830) 625-7122 - Old World antiques and collectibles shipped directly from Europe - complimented by unique furnishings & gifts for the discerning shopper. Exclusive seller of Verbena Soap Company products. (830) 627-8999 - As seen in Southern Living magazine. Offering a unique blend of interesting antiques and one of the best pickle recipes you've ever tasted. GRUENE ANTIQUE COMPANY | (830) 629-7781 - Over 6,500 square feet of antiques, collectibles, gifts and decorator items. Housed in H.D. Gruene's Texas Landmark mercantile building (c. 1903) with original bank vault. THE BARN POTTERY | (830) 629-7975 - (Formerly Buck Pottery) Come see a craftsman at work. Featuring hand-thrown, wood fired pottery. Also showing the handwork of other skilled potters, jewelers, metal smiths and wood workers. THE BEST LI'L BATH HAUS | (830) 302-7999 - Delight in creating your own custom salt scrubs and lotions! Proudly offering luxury bath products and trusted brands. Find gifts, decor and local charm! 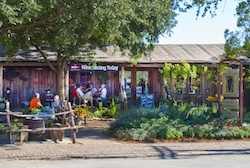 COTTON EYED JOE'S | (830) 620-1995 - Steeped in Gruene's rustic atmosphere, you'll find a great collection of Texas and Gruene-themed gifts, souvenirs, and, of course, T-shirts! DANCING BEAR | (830) 629-2059 - Unique collectibles, inspirational, candles, scents, home decor, signs, specialty foods, jewelry, purses & accessories. Visit the gardens. ELEMENT 29 | (830) 625-2929 - There's nothing ordinary about this boutique. Design-driven apparel, accessories, decor & more. Locally designed and printed infantwear and gifts, plus a wall of uncommon socks. GALLERIE AT GRUENE | (830) 629-2059 - Contemporary fine art created by six local artists. Paintings, sculpture, pottery and handcrafted jewelry. GOT TOYS | (830) 620-4700 - Not your average toy store! Carrying an eclectic mix of toys for newborns to adults. Feel young again with a variety of classic tin toys, joke items, retro games and much more. Come see the giant duck! (830) 606-0093 - Complimentary tastings daily! Large selection of wine from Texas and beyond, select craft beers on tap and wine accessories. Outdoor seating. Seasonal fire pits or misters. Live music every weekend except in January. Friday Happy Hour all year long! THE GREAT TEXAS PECAN CANDY CO. | (830) 627-3343 - Handmade Pecan Candies. GRUENE GENERAL STORE | (830) 629-6021 or (800) 974-8353 - Selected as one of the 40 best places to visit in Texas: soda fountain, homemade fudge, Texas foods, unusual gifts, books, cards, antiques, signs and tins, all in a nostalgic setting. GRUENE HAT COMPANY - The tiniest hat shop in Texas offering customized cowboy hats for every style. Home of HD Gruene's original bank vault. 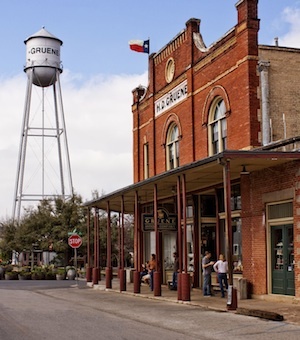 THE GRUENE HAUS | (830) 837-5590 - A historical landmark full of fabulous Texas treasures! From trendy clothing and accessories to home decor, this small cottage has big style! THE GRUENE OLIVE TASTING ROOM | (830) 632-5170 - Sample over 50 different flavors of Ultra Premium Virgin Olive Oils & balsamic vinegar fresh from the tap. Great gifts. Private tasting parties available. GRUENE OUTFITTERS | (830) 625-4440 or (888) 477-3474 - Top-of-the-line outdoor wear, fresh and saltwater fly tackle, footwear and fine accessories such as hats, sunglasses and travel gear. Also, fly fishing lessons. GRUENE WITH ENVY | (830) 627-0612 - Fabulous fashions such as Ivy Jane, Johnny Was, Double D Ranch, YellowBox and many others. Offering the largest selection of Corral "cowgirl" boots in town! Open daily. GRUENEWERKS (830) 708-4446 - Leasing commercial space in Gruene. HUNTER JUNCTION | (830) 629-4900 - Since 1981, Gruene's first retail shop. Suppliers of quality t-shirts, sportswear, gifts and souvenirs. Located in the 1854 Rudolf du Menil building. Open daily, year round. NATURAL SELECTIONS | (830) 627-2922 - Located in the Casa de Pablo Lopez. Specializing in rocks, fossils, jewelry, antiquities from abroad with arrowheads and artifacts. Including home accents, framed art and unique gifts with a Texas twist. THE POMEGRANATE | (830) 609-9790 - Carrying the highest quality of clothing, footwear and accessories for women and youth from brands we've tested and trust. Find gifts, decor and local charm. POOKIE JANE'S | (830) 626-6446 - Celebrating 10 years! You will fall in love with this boutique! Find your next Consuela bag, apparel, jewelry, shoes & handmade candles. Home of the original "ManCave". Find Pookie Jane's on Facebook. SMILING EYES PHOTO GALLERY | (830) 629-7474 - Old time photos since 1975. Award winning western themed portraits. Costumes and props provided. Individuals, couples, families and groups. TIPSY GYPSY | (830) 625-4431 - Everything you need to complement you boho-chic lifestyle: Fair trade fashions that feel as good as they look, incense and candles that create a perfect vibe for any space and more to achieve personal zen. WYLDE ROSE BOUTIQUE | (830) 505-5102 - Featuring women's apparel and accessories. Bohemian style and handmade items you will love.